It’s 2017, and having a credit card is like having a cellphone, everyone has one. Credit cards have become a critical financial instrument that many Americans become all too reliant upon. For better or worse, consumers use their credit cards for everything from groceries to that month’s water bill. For something that can be such a useful and impactful tool, credit cards carry significant risks if not handled properly. Misusing a credit card can lead to borrowing more than you can afford to repay, which leads to lost money on late fees and getting charged a penalty APR. Missed or late payments can have a damaging impact on your credit score, which will lead to difficulty in getting a loan or new line of credit in the future. >> Read More: What happens if you miss a credit card payment? The risks, but also the benefits, are clear when it comes to credit cards. Credit cards offer sign-up bonuses, cash back, and other promotions for everyday spending. To find the answer to that question, LendEDU commissioned a poll asking 500 millennials a variety of questions regarding the plastic in their wallet. Why millennials? Millennials are not only the largest living generation on Earth, but many are just beginning their usage of credit cards, and their young credit histories are more at risk to be significantly damaged by credit card misuse. The results of LendEDU’s Millennials & Credit Cards Survey showed some positive trends amongst millennials, but also some results that were very concerning. 1. Which of these reasons best describes why you have a credit card? 2. Did a sign-up bonus incentivize you to open a credit card? 3. Which of the following best describes your credit card usage? 4. Have you considered opening up a balance transfer credit card to pay down your credit card balance? 5. Would you consider the thought of using a credit card a scary thing? 6. Are you dependent on your credit card for basic living expenses (e.g. monthly rent, groceries, water bill, etc.)? 7. Do you see your credit card as a status symbol? 8. How many credit cards do you have? 9. What was your primary reason for opening up an additional credit card? 10. Have you ever completely missed a credit card payment? 11. What is the impact of a late payment on your credit score? 12. If your credit card company increases your interest rate, can you do anything about it? 13. Do you know your current credit card limit? 14. Have you ever maxed out your credit card limit? 15. Do you know your current interest rate on your credit card? 16. Do you know the late-payment fee charged by your credit card company? 17. Do you know the penalty APR charged by your credit card company after a late payment? Overall, millennials have a great grasp in terms of why they should have a credit card. The absolute majority of respondents, 69.40 percent, said they took out a credit card in order to build a credit history. This is an excellent reason to have a credit card; you can never be too young to start building credit, and a strong credit score will pay dividends later on in life when you need an auto loan or a mortgage. Judging by the results of our poll, many millennials are dependent on their credit card for basic living expenses such as monthly rent, groceries, and utility bills. 30.60 percent are dependent on their card for these types of expenses, while 69.40 percent are not. Most financial experts argue that credit cards should not be used for serious (and hefty) expenses such as monthly rent and bills. ​Another interesting trend involving millennials and credit cards: They have too many! While 52 percent of respondents do only have one credit card, 7 percent of millennials have five or more credit cards. 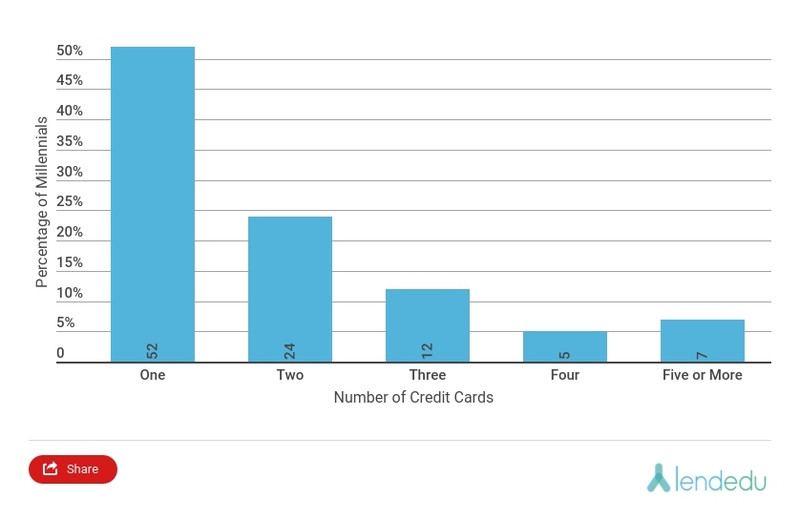 24 percent have two credit cards, 12 percent have three cards, and 5 percent have four cards. One credit card is great, two is fine, three is acceptable, and anything more than four is arguably too many for a young adult. One final observation regarding millennial’s usage of their credit card(s) is that many of them have maxed out their credit card limit. Our poll found that 36 percent of millennials have maxed out their credit card before! The remaining 64 percent claimed that they have never maxed out their card. Maxing out your credit card can have ramifications for a consumer. First, it can put you in a difficult position should you run into a financial rough patch. Second, it can have a damaging impact on your credit score. Millennials should not be maxing out their credit card this frequently; in fact, using anything more than 30 percent of your credit is not a prudent financial decision. We asked 500 millennial credit card holders the following question: “Would you consider the thought of using a credit card a scary thing?” The majority of respondents, 58.80 percent, said they do not see credit cards as a scary thing. Meanwhile, 41.20 percent of millennials do indeed see a credit card as a scary thing. Too many millennials are intimidated by credit cards when they should not be! Sure, opening up a credit card can seem like a stressful process, but the only way to move past it is by actually doing it. Credit cards can be an extremely useful tool if used properly, and they can also greatly enhance your credit profile. Millennial’s fear of credit cards can be traced back to the Financial Crisis of 2008. ​According to an analysis of Federal Reserve data done by The New York Times, the percentage of Americans under the age of 35 (millennials) who hold credit card debt has fallen to its lowest level since 1989. Growing up through the Great Recession, millennials have an inherent fear of taking on debt of any type, especially credit card debt judging from LendEDU’s poll results. The second question regarding millennial’s perspective of credit cards read like this, “Do you see your credit card as a status symbol?” 76.40 percent of respondents said that they do not see their credit card as a status symbol. Nearly a quarter of millennials, 23.60 percent, ​do see their card as a status symbol. A credit card is a useful financial tool, but a status symbol? Treating your credit card like a key to the upper echelons of society could lead to spending above your means and a mountain of debt. The results of another question proved that the majority of millennial credit card holders are unaware of a rule that allows them to protest an interest rate hike from their credit card company. 68.40 percent said they must accept an increased interest rate. Only 31.60 percent knew that they have the ability to refuse the increase. Under the Credit Card Accountability and Disclosure Act, known as the CARD Act, a credit card holder has the right to refuse to pay a higher APR set by the credit card company. While chances are slim, the credit card company might agree to the older, lower interest rate. Or, they may lower your line of credit, raise your monthly minimum payments, or cancel your card all together. If cancelled, the consumer still has a minimum of five years to pay off their card balance at the old interest rate. In other questions related to millennial credit card holder’s knowledge of their plastic, the results were a mixed-bag. 83 percent of respondents knew their current card limit, while 17 percent did not. In terms of knowing their current interest rate on their card, millennials were more split down the middle. 55.40 percent did know their current interest rate, while 44.60 percent did not know their current rate. The majority of millennials, 65.60 percent, were aware of what the late-payment fee charged by their credit card company would look like. 34.40 percent did not know what their late-payment fee would be. Finally, more millennials did not know the penalty APR charged by their credit card company after a late payment than those that did. 52.20 percent were not able to identify what the penalty APR charge would look like, while 47.80 percent said they knew the penalty APR charged by their credit card company. All results from this study came from a poll commissioned by LendEDU that was conducted by online polling company Pollfish. The poll ran over a two day span from June 29, 2017 to June 30, 2017. All respondents were screened to ensure all poll participants were millennials and owned a credit card. The screener question was the following, “Which of the following sentences best describes you?” Out of six potential answers, the one accepted answer was the following, “I identify as a millennial and I have a credit card.” In total, 500 millennial credit card holders were polled and were asked to answer each question truthfully.